Transporting your child safely in the car is not an easy thing to do. Most parents make an attempt to fasten their children in properly, but a National Highway Transportation Safety Administration study found that 80 percent of all child safety seats are installed incorrectly or misused. The same study showed that in more than 50 percent of deaths due to car crashes in children less than 15 years old, the victims were not properly restrained. Research has shown that child safety seats reduce the risk of dying in a car crash by 71 percent. The lesson to be learned from these figures is that we need to secure our children, our older passengers, and ourselves properly each and every time we ride in a motor vehicle, no matter how short the trip may be. Keep in mind that most car crashes take place two miles or less from home. Infants are required to be rear-facing until one year of age and 20 pounds, but new crash studies show that infants are much safer if placed in the rear facing position. Forward facing infants do not have the neck strength to protect their head, neck, spine and back if involved in a car crash. 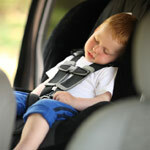 The most recent recommendations are to keep your baby rear-facing as long as possible into the second year of life. If you have a 9 month old who weighs 25 pounds, he needs to be rear facing at least until 12 months is reached. On the other hand, if you have a 16 month old who is 18 pounds, he must remain rear facing until 20 pounds is reached. The weight limits on the infant safety seats are 18 to 22 pounds and the height limit is 26 inches. The convertible child safety seat can be used in the rear facing position until approximately 20 pounds is reached and then turned around into a forward facing position for 20 to 40 pounds. The height and weight limit varies from car seat to car seat. Be sure to check your car seat for its height and weight limits. You should keep your child in a forward-facing safety seat with a full harness until he reaches 40 pounds and 4 years old, or until your child reaches the weight limits of your safety seat. Be sure to check the weight and height limits on your car seat. Your child is not safe in his or her car seat if he or she has gone over the height and weight limits. Once a child is at least 4 years old and 40 pounds, and has outgrown the forward-facing child safety seat, a booster seat should be used. A high-back booster seat comes with a 3 point or 5 point harness for younger children who are not quite mature enough for the belt positioning boosters. The harness keeps the younger child restrained safely. Belt-positioning booster seats have no back to them and no harness. They are a plastic seat that simply boosts your child up and uses the shoulder and lap belt from your car. Shield boosters are another type of booster seat. These are not recommended, but can be used if a lap belt is the only type of seat belt available. Shield boosters are not appropriate for children more than 40 pounds and for taller than average preschoolers because of the risk of internal injuries in a car crash. Wisconsin's laws requires that you keep your child in a booster seat located in the back seat until he reaches 8 years of age, weighs more than 80 pounds or is taller than 4 ft. 9 inches. These conditions need to be met before it is legal and safe to be out of a booster seat. Note that the American Academy of Pediatrics advises the use of the booster seats in the back seat of the car till children are between 8 and 12 and are over 4 ft. 9 inches and can safely use the standard seat belt. The shoulder strap needs to fit across the chest, and the lap belt needs to fit across the hip. The child should be able to sit with his knees bent and his back against the seat of the car. The seat belt was designed to fit an adult, not a child. This is why booster seats are required. Never let a child who requires a car seat or booster chair sit in the front seat with an air bag. This is very dangerous. Head and spinal cord injuries can result from the force of the airbag on impact. Please share this information with any older children or adults that may be driving your children to and from activities. The harness straps should be very snug. If you can pinch the fabric, it is too loose and needs to be tightened. This is true for all ages of children in child safety seats. For a rear-facing infant, the lowest harness slots should be used. The straps should be below or at shoulder level. If your infant seat did not come with a built-in head support, you should not add one. Instead, you should roll up two receiving blankets and, starting at the infant's head and ending at his toes, line the outer side of the car seat with the receiving blankets, having one blanket on each side of your baby. This will keep your baby safest in the car seat. Do not purchase a head support to add on to your car seat. In a car crash, this is considered to be unsafe and dangerous for your child. Never let your infant less than 6 months wear a snowsuit in a child safety seat. The harness straps will not fit properly, your child may overheat and, in a crash, it can be dangerous for your child if he is wearing a snowsuit. Car seats have an expiration date. Please refer to your seat for its expiration date. If one is not printed on it, assume 6 years from date of manufacture. If your car seat is in a crash, destroy it. Call your insurance company for possible reimbursement. Don't start the engine until everyone is buckled. If you have an unbuckled passenger in your back seat and you are in a crash, you can get injured.